I hear stories that often include the phrase "I felt God’s call" or "God spoke to me" so often that I find myself slightly skeptical of God’s involvement in the event. With that said, lately when I am asked to move outside my normal routine, I find myself responding, "Is this you, God? Are you speaking to me? Is this a call?" Such was the case recently when I began to learn more about the Criminal Justice and Mercy Ministries (CJAMM) of the Oklahoma Conference. Through my involvement with United Methodist Women, I was introduced to Exodus House and New Day Camp, both part of CJAMM. At Edmond-First United Methodist Church, my UMW small group (the Seeker’s Circle) had formed as a book study circle, and we read selections from the UMW Reading List. We read a book about prison ministry and decided that offered us a mission opportunity. To help us figure out how to get involved, we invited guests from Exodus House to a UMW meeting. Exodus House provides temporary housing and help for people newly released from prison. 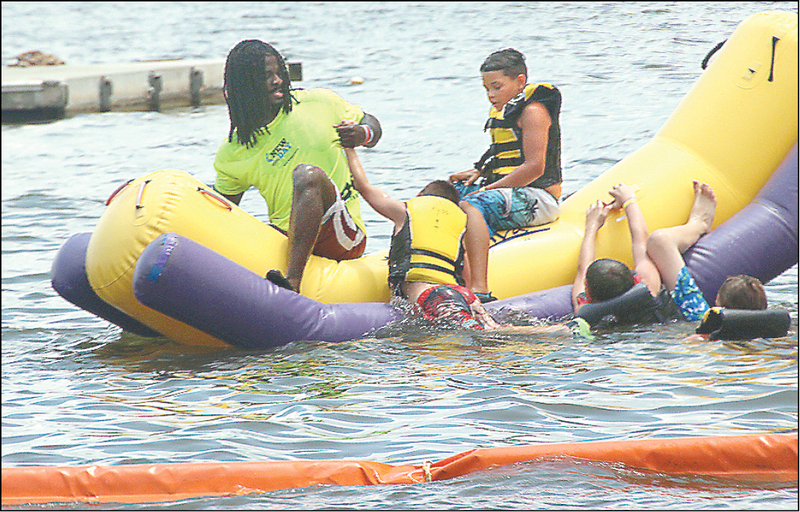 New Day Camps are for children of incarcerated parents. A few months later, I attended a district UMW meeting; the speaker was a New Day Camp representative. At that meeting, I knew for certain that New Day Camp was indeed God’s call for me. I sent an email to the Conference office, indicating my interest in volunteering, and quickly received sign-up forms. The process included a background check. Fast-forward to June 24, the final day of camp. There was no doubt in my mind that I had been placed intentionally at New Day Camp. I had been privileged to be God’s servant to the children there. The program was held at Cross Point Camp, the United Methodist facility beside Lake Texoma. Three girls were in my care almost continuously. We were in a small group that stayed together for all the daytime activities and included two boys, cared for by another leader. In addition, the girls and I were housed in a cabin with eight more girls and a Leader-in-Training, serving there with me. Typically I arose early for some quiet time, then woke and assisted the girls getting ready for the day, and then met up with the boys for breakfast. Our scheduled activities included crafts, service projects, small-group lessons, focus sessions (counseling), swimming, hiking, outdoor games, and worship. I hadn’t been a mom to 7- and 8-year-olds in quite some time, but that didn’t matter. I experienced extraordinary patience, calm, and understanding as I moved through the joys and challenges of each day. I had more energy than I thought possible! In the cabin at the end of each day, the Leader-in-Training and I gathered up the girls and, by the light of a flashlight, the group completed a fleece blanket. Another member of my Seeker’s Circle at Edmond-First had purchased and cut the fabric; in the cabin we tied off the edges — the finishing touch. As we worked on the fleece spread across our laps, we talked about the day, both the good and the bad. I told the girls that the blanket had been prayed over before I brought it to camp — that prayers had been said for these young campers even before we met. I told them that I was certain God placed me in camp so I could meet each of them and that they will always be in my heart. In my private time after we ended each day with prayer and hugs, I thanked God over and over for directing my path to this place, and I asked God’s guidance for the next day. Months have passed since my New Day Camp experience, but I remember it well. I pray regularly for the New Day children and adults. I received a letter from one camper’s grandmother. "He was so excited about it that he has said many times that he can’t wait to go again next year," she wrote. My sentiments exactly; I can’t wait to go again next year! 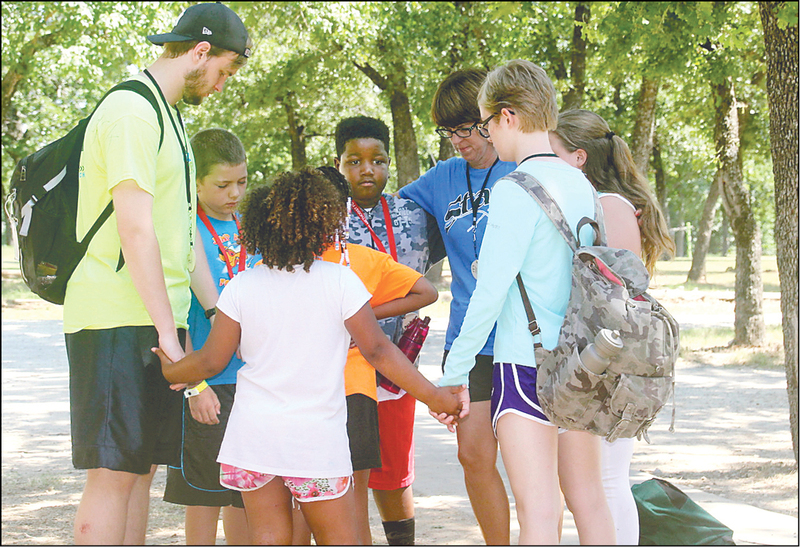 Volunteer Ellen Lyons, in the darker blue shirt, circles up with her small group for prayer during New Day Camp this summer. 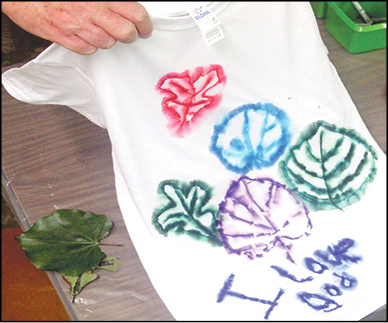 Campers gathered leaves to create colorful designs on T-shirts. 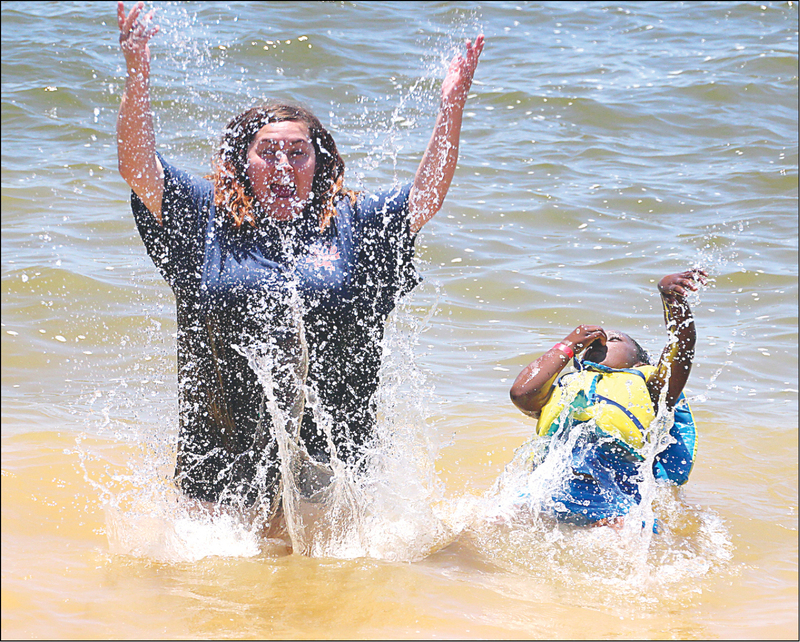 WONDERFULLY WET — Youngsters and adult volunteers revel in the waters of Lake Texoma during CJAMM’s New Day Camp, which each summer serves children whose parents are incarcerated.